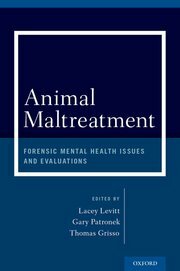 I contributed a chapter to the upcoming book "Animal Maltreatment: Forensic Mental Health Issues and Evaluations" edited by Edited by Lacey Levitt, Gary Patronek, and Thomas Grisso (Oxford University Press). This title will not officially launch until Movember 2nd but is available for preorder (Amazon). If you are interested in buying a copy contact me for a 30% off discount code.